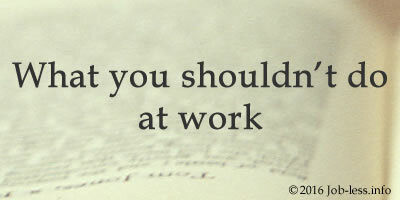 American web portal has formulated "nine office precepts"
This bible precept is especially actual for office worker. As often we forget that paper for the printer, disks, notebooks and the pens lying on a desktop are company property. Today the habit to take away home everything that provocatively badly lies, it isn't considered something outstanding. Unfortunately, very few people understand that this is banal theft. And if the administration catches you behind this occupation, dismissal will be not far off. 2. Do not blame others for your mistakes. This is dishonest, stupid, and simply childish. It is very unpleasant to confess that your mistakes have affected the quality of general work. But how much more unpleasant to admit that you have lied and slandered another because of your own blunders. Heard gossip, do not spread it further. Who knows, maybe the object of gossips will decide to find out who is the source, and will come to you? Then explain that "you have nothing to do with, and it is blame the chief secretary, who said something to the manager in your department", and so on. 4. Don't pretend to be ill. If the tiredness and a depression overtook you or you simply need a day off, take a compensatory leave or vacation at own expense. Lies can do only much harm. If pretending "the sickest person in the world", you by chance will run into the colleague or the chief in shop; don't think that your sudden healing will make someone happy. Probably so your work in the company can end. 5. Don't go to work if you are sick. If you do get ill, then infect colleagues is not the best way to win their respect. Take the sick-list and stay at home. Nobody will appreciate your feat, and having fever it is too simple to make a mistake. 6. Do not use office equipment for personal purposes. It is not necessary during working hours on the phone to discuss the details of all the gossip, new purchases, cool cars, etc. ; and do not print to the office printer complete works of Arthur Conan Doyle. Also you shouldn't use the "free" internet to fill your Live Journal tens of gigabytes of images. Remember that patience of your boss is not unlimited. Your punishment can be really harsh: from a rebuke to dismissal. 7. Do not discuss personal problems at work. If something in your private life disturbs work, it is a reason for day of rest, a time off or even dismissal at own will. Anyway, you shouldn't be cried on colleague's shoulder. It is not only unprofessional approach to the question, but also won't help the cause. If your career proceeds in the same firm, you won't manage to get rid of reputation of the moaner and the neurotic. 8. Do not dress untidy. It does not matter how many years you have worked in the company, how your boss "is one of us"; how many hours did you sleep last night, and how hot is outside. Clothing should always be clean, perfect and the corresponding general office style. Before "rushing with the head in a maelstrom" of an office romance, for example, with the chief, take an interest how to regard in the company with similar situations. Think about, whether you are ready to dismissal if your flirting is unsuccessful. And the main thing whether you will can continue to work side by side with your ex-lover if the relations disorder. If you are going to get the affair with the subordinate, you can add an indictment of sexual harassments to all your previous problems.